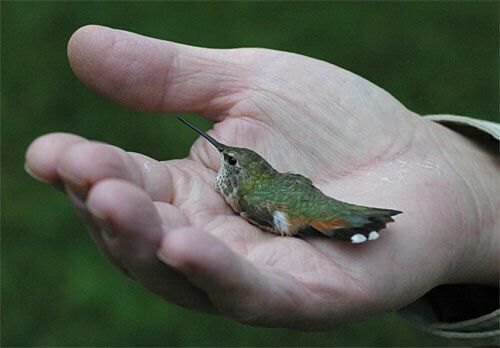 On 17 October 2003, we got an E-mail from Lenore Berry in Rock Hill SC (York County)--about 15 miles from Hilton Pond Center--saying she had just seen a hummingbird at her feeder. 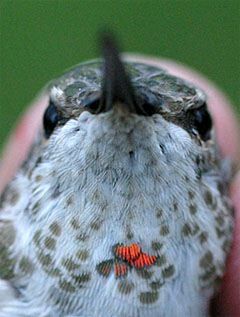 Lenore explained she didn't think it was a Ruby-throated Hummingbird, a logical conclusion since 99.9% of all ruby-throats are likely gone from the Caroina Piedmont by mid-October. (Our latest on receord at Hilton Pond is 18 October). We asked Lenore to keep an eye on her two feeders and to let us know if the bird re-appeared. Every day or so after that we'd get an E-mail from Lenore saying that she had had a fleeting glimpse of the hummer or that she hadn't seen it at all--until on 30 October she wrote that she hadn't seen the bird in a week. Despite Lenore's waning optimism, on 3 November the bird re-appeared and fed on a daily basis for the next week, so we made plans for a banding foray on 10 November. 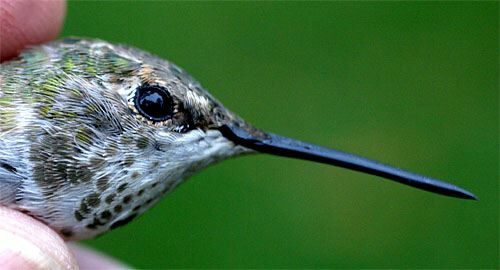 According to our usual strategy, we arrived at the Berry residence just before dawn at 6:15 a.m., opened the second-story window, and hung our portable hummingbird trap containing a feeder. Then we sat back to wait. And wait. And wait. Suddenly, at 8:10 a.m., a hummingbird flew in, looked at the feeder and trap for little more than a microsecond, and buzzed off. So we waited a while longer. And longer. And longer. Despite a serving of Lenore's incredibly tasty raisin and nut bread, we finally called it quits at 10 a.m. and pulled the trap, promising to return if the bird ever started showing on a regular basis. A couple of weeks later--on 24 November--we got another E-mail from Lenore saying that the water level in one of her hummingbird feeders had been dropping and that she and husband Jim had seen the hummer again. Not wishing to rush off for another strike-out, we decided to wait a few days to see if the hummer made regular visits--which it did. On 5 December we made another trip to Rock Hill. With the sun rising later, we arrived at 6:45 a.m. and had the trap hung by 7 a.m., at which point Lenore went down to prepare another serving of raisin and nut bread. Breakfeast got postponed, however, because the hummingbird appeared and flew directly into the trap at 7:07 a.m.--at which point we hit the remote release button and watched the trap door slide shut. We shouted down to Lenore, who came up the stairs to watch as we opened the trap and carefully removed a hummer with rust at the base of its tail (left)--an obvious Selasphorus hummingbird. 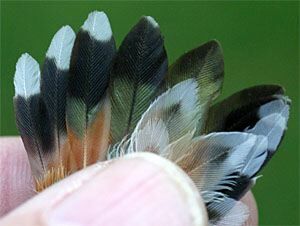 Our usual measurements (below) and plumage exam indicated it was a young female Rufous Hummingbird, S. rufus, rather than the somewhat smaller Allen's Hummingbird, S. sasin. 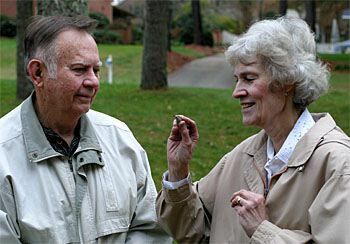 After measuring and banding the Berrys' bird, we hand-fed it some sugar water, photographed it, and let Lenore and Jim hold it to experience the near weightlessness of a hummer. The bird sat quietly in Jim's palm for more than a minute (top photo), but when we placed it in Lenore's hand it was off like a shot. Thanks to the Berrys for maintaining their hummingbird feeders past the traditional take-down date, and especially to Lenore for her faithful phone calls and E-mail correspondence that led to our finally trapping and banding her bird--which may or may not have been the one we first tried to capture 'way back on 10 November. POSTSCRIPT: This bird was retrapped at the Berry residence on 17 November 2004.